Israel’s Urban Aeronautics has been working on a concept for a truck-sized flying machine that can go places where even helicopters can’t for over decade. It has always seemed like an intriguing and promising idea, but now, after years of development, it is becoming a reality. 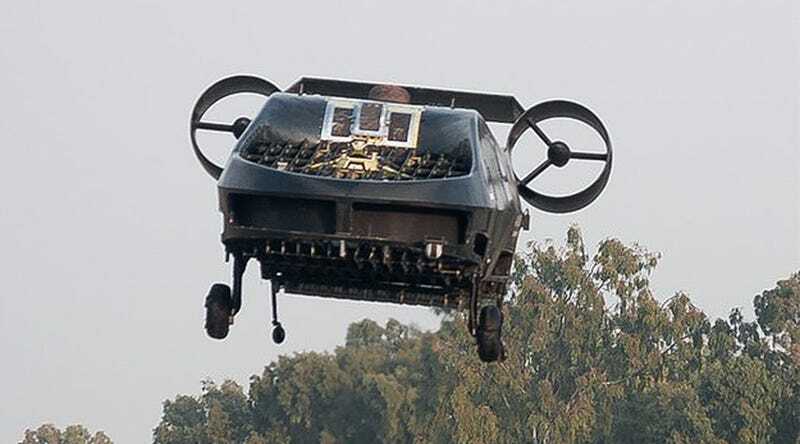 Just days ago the futuristic machine, dubbed the AirMule, made its first untethered flight. The concept that led to AirMule was originally called the X-HAWK LE, but the idea really gained steam after lessons learned during the 2006 Lebanon War. That made apparent the need for a craft that could extract wounded soldiers in enemy territory, but didn’t need a clear and open landing zone like a helicopter. Since then the concept has been tested successfully in various subs-cale forms, and now in a full-scale one. The AirMule is a pure vertical takeoff and landing (VTOL) design, and uses ducted fan-like lift rotors tied to a central turbine powerplant for propulsion. Right now that powerplant is a 730 horsepower Turbomecca Arriel 1D1 turbine, but the production aircraft is envisioned to feature a 985 HP engine. The aircraft weighs close around 1,700 pounds empty and has a max gross weight of 3,100 pounds, giving it a respectable payload. It is designed to fly at 100 knots and up to 18,000 feet, so it is not just a clumsy VTOL novelty machine. The production version will supposedly be able to carry nearly 1,000 pounds over 185 miles. Additionally, the AirMule is envisioned as primarily an unmanned aircraft but manned models are possible. As such, it can be put to work in places where nobody would dare to go. Unmanned helicopters and other vertical lift aircraft are quickly becoming one of the most promising subsets of the high-end unmanned aircraft marketplace. The AirMule could find a unique place within this emerging capability set. Really, AirMule is the closest thing to flying car out there. Not the type that drives and flies, but one that just flies point to point, like what you see in science fiction movies. All without long rotor blades that limit access to tight spots. Urban Aeronautics envisions many missions for this new technology. First off, the concept is eyed for military resupply and medevac missions, and those are both areas that militarizes are looking for innovation in, but that is just the beginning. Armed scout and reconnaissance work would be a perfect job for a militarized AirMule variant, as it could hide where helicopters cannot and fly right down streets and up trails, places where helicopters are extremely vulnerable to rotor strikes. In direct combat, such a weapon system could provide extremely close air support for troops in enemy contact. Even deploying off the back of tractor trailers. The fact that it can maneuver so low to the ground, and that it uses as centralized power source, could give it stealthy properties. Even its shape may be adapted to minimize radar return. Since the AirMule can rescue civilians from places where helicopters can’t, it can also move people and material to places where helicopters can’t, especially in urban environments. And it can also go where helicopters can, but in supposedly a much safer fashion. Missions such as power-line maintenance and high-rise construction that are executed by standard helicopters today, could be done by AirMule variants in the future. Such a craft could also revolutionize emergency air ambulance service as we know it today as well as airborne law enforcement in urban areas. Even firefighting and rescuing people from fires in skyscrapers has been floated as a mission for AirMule derivatives. The maritime environment is another place where AirMule could thrive. Smaller vessels that could not operate helicopters due to deck and structural limitations could deploy with a Cormorant (the export version of the AirMule). This would breathe a whole new set of capabilities into yachts, small naval vessels and exploration ships without having to make costly alterations to their designs. For those ships that can operate helicopters, this design would allow for quicker deployments and safer terminal operations than their rotor-headed counterparts. Since the aircraft is being designed as optionally manned, it also offers more flexibility than a traditional helicopter. AirMule could even become an air taxi, or even a flying car, traveling from inside one building to another in dense urban areas. This possibility is not lost on Urban Aeronautics who has started a subsidiary called Metro Skyways, which will develop a car sized VTOL flying machine for the civilian market that shares many of AirMules technologies. This initiative brings the concept full circle as X-HAWK was envisioned as being able to offer similar capabilities. In doing so it could also throw a revolutionary twist into private aviation as we know it. Too Exotic And Too Much To Prove To Succeed? Although Urban Aeronautics’ dream is exciting, it still has a long way to go to prove not just its baseline capabilities, but its reliability, controllability and cost effectiveness. Additionally, weight growth could kill this concept very quickly—something we have seen with countless VTOL projects. It also has to prove its own safety. Although it can go where helicopters cannot, its non-traditional design may be a hurdle when it comes to achievable a spot in a crowded helicopter marketplace. Also, no rotors means no auto-rotation, which allows a helicopter what loses power to make a safe landing under certain conditions. If the AirMule’s engine quits or a fan stops spinning, then what? Apparently, Urban Aeronautics looks to add a ballistic parachute system to their designs to account for this. There’s also something of a historical stigma when it comes to duct-fan propulsion like that used on the AirMule and the flying car idea in general. Aviation history is littered with decades of failed concepts that utilized similar systems. But the vast majority of these were built long before fly-by-wire control systems, extreme flight control automation and sense-and-avoid sensors were commonplace. As such, maybe the corky flight and performance characteristics and ambiguous mission set of similar past concepts can now be overcome in a brilliant way. In the end every aircraft design has its trade-offs. One safety measure may be traded for another. Speed and range may be traded for operating area accessibility. Yet even with these issues, the AirMule is one exciting flying machine. If Urban Aeronautics can deliver on these promises, this dream could have a very bright and lucrative future. With their recent first free flight under their belt, and 200 tethered flights as well, the company seems to be well on their way to making that dream a reality.